“I was extremely saddened to hear about the passing of my dear friend, Lord Eric Avebury earlier today. On behalf of the Ahmadiyya Muslim Community, I would like to extend my condolences to Lord Avebury’s wife, children and other family members. Lord Avebury was a tireless campaigner for human rights and spent his life working towards establishing peace in the world. Indeed, it was his exemplary work in this field that led him to being the very first recipient of the Ahmadiyya Muslim Prize for the Advancement of Peace. Most certainly, Ahmadi Muslims across the world will miss Lord Avebury and will forever hold sentiments of deep respect for him. 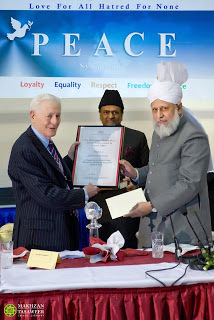 Share the post "Head of Ahmadiyya Muslim Community statement following death of Lord Avebury"